The tower houses a ring of 12 bells cast by the famous Croydon firm of Gillett and Johnston Ltd. in 1936, replacing an earlier ring of eight. The eight original bells were recast and hung with new fittings in a new frame with four additional trebles. The new ring of 12 was dedicated by The Right Rev Lord Bishop of Croydon on 12th December 1936 and the first peal on the new 12 was rung for the Coronation of King George VI in 1937. There are now actually 14 bells - a ring of 12 with 2 extra bells. An extra 'flat 6th' was added in 1946 by Gillett & Johnston, which allows the use of a 'middle 8'. An 'extra treble' was added in 1978 by the Whitechapel Bell Foundry, which allows the use of a 'light 10' and 'front 6'. 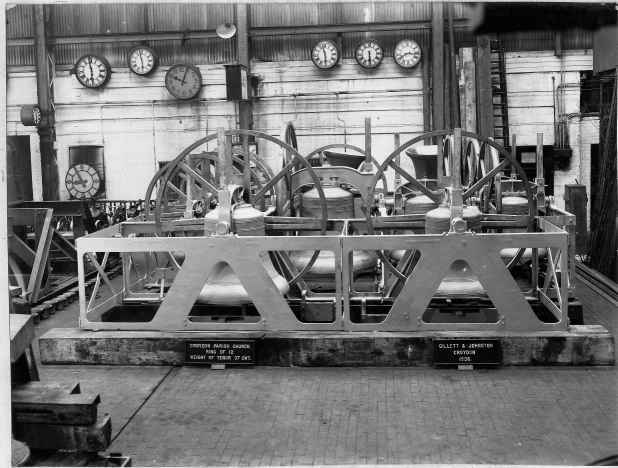 The 12 bells all hang in one main frame, and the 2 extra bells hang in separate frames above the main frame. There is also an unusual 'clapper turning mechanism' installed above the Tenor bell. This novel labour-saving safety device is able to 'flip' the Tenor clapper over to the correct side of the bell (in the usual case where it has been rung-up 'wrong'). It is operated by pulling on a special rope in the ringing room. Otherwise, a ringer would have to climb more stairs to the bell chamber, clamber amongst the raised bells, and change the position of the clapper by hand - a potentially dangerous procedure!